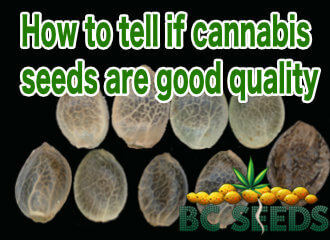 How to tell if cannabis seeds are good quality. For the best quality cannabis, you need to start with good seeds that have good genetics. But how do you tell if the seeds are good quality? Are the seeds dark or light in colour? Are they hard when you squeeze them or do they crumble? Cannabis seeds of superior quality are usually dark grey, brown and dark brown, almost black. Sometimes they have stripes in them called tiger stripes. They will also usually look shiny in the light, like a glossy oil reflection. Typically the darker and shinier the seeds, the better the quality. But not all strains produce dark fat shiny seeds. Some strains are light grey and some of the biggest bud I’ve ever grown came from the tiniest black seeds I’ve ever saw. I wasn’t even sure those tiny seeds were cannabis, but a few months latter, you bet they were. Green seeds are almost alway immature, but I’ve seen strains that made larger green seeds that were top notch. How to tell if cannabis seeds are good quality comes with experience. If the seeds are small and green then you’ve probably got immature seeds harvested too early. You can also test them by squeezing them to check their firmness. If the seed does not crack or crumble under pressure it is good quality. When a seed dull, its a sign they are older and less likely to germinate. The best method used to find the cream of the crop seeds is to use the pressure test. Immature seeds are green or light in colour and are not usually worth planting. Older seeds become unusable over time and will crumble under slight pressure. These are no longer viable and not worth using. How to tell if cannabis seeds are good quality using the float test. You can also test seed quality using the simple float test. Fill a container with water and put the seeds on top of the water. They will either sink or swim. Seeds that sink are viable so plant them. Get rid of the ones that float as they are likely of poor quality. Discarding bad cannabis seeds can be as easy as turning on a fan. Just lay your seeds on a dinner plate just one cm deep. Place a small fan in front of the plate and turn it on the lowest fan speed. The bad seeds and debris should blow right off, leaving the good cannabis seeds behind. This is fast and easy way to sort large quantities of cannabis seeds automatically. But you should always test each individual seed with the pressure test if you plan on selling them. Some seeds will appear normal but disappear into dust under slight pressure between your fingers. But the fan should blow these types of bad seed away. You may need to adjust your fan speed higher or move it further away if your results are not as desired. Never start your fan too close to your seeds and on the highest speed setting. You could lose all your good seed. Make sure you do this in a clean room, so if you good seeds happen to blow all over your room, you can sweep them back up without all the dirt on the floor. Keep the fan pointed in the direction of your room where there are no heating registers for the seeds and debris to fall down. Don’t do this outdoors as you may never recover all you good cannabis seeds from the dirt as they will be hard to spot. Thanks for the tips, I almost threw six auto flower sativa beans away because they were greenish. I just sprouted them and they’re not deformed or anything, the seeds are good.